Don't guac around, we all know you're coming queso you want new leads in your inner circle! Join us for National Nachos Day and ystark! 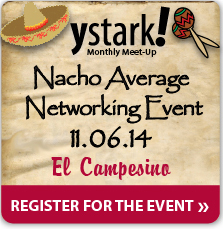 's inaugural Nacho Average Networking Event. Similar to our Shamrock Social Shuffle of years' past, you'll be networking all night so bring lots of business cards to taco 'bout your business and chip your way into their network!